Threepointplay: Check Out My Cards! I recently decided to try out checkoutmycards.com and placed an order for 100 lower price cards on their website. This morning the cards arrived and I have to say that I am very impressed with the website and its service offering. The site itself is intuitive and simple to use. I was quickly able to locate the cards I wanted, add them to my cart and make a payment via PayPal. My order was quickly acknowledged by the site and I received regular communication, prior to them being dispatched. I particularly liked the e-mail I received that provided a copy of my invoice and included a simple statement that read "your order is being packaged to....if this address is incorrect, please reply to this email". Simple, but a very nice touch. The package arrived in the mail today and as you can see from the image above, was superbly packaged. 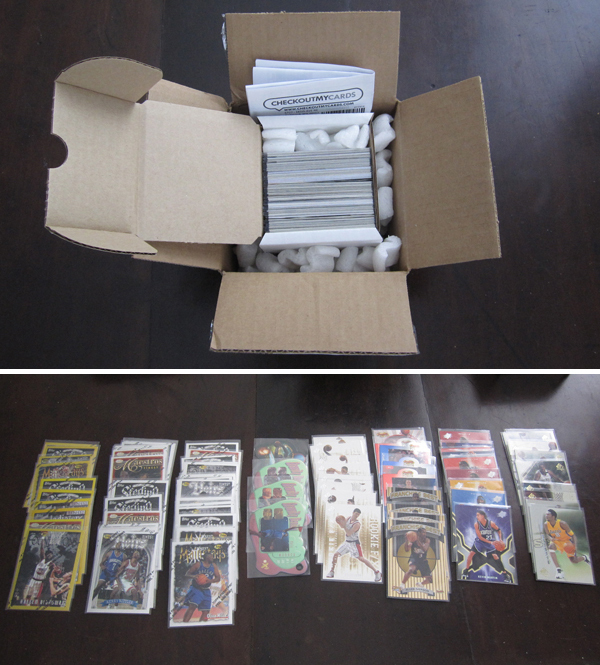 Each card was in a soft sleeve and then placed into a standard 200 count card storage box. The box was then packed out with polystyrene foam. This box was then packaged in a second box and again packed out with polystyrene foam and my invoice. Perfect! In short an excellent experience and one I will look to repeat regularly; particularly for lower priced cards which are not always easy to find. I am that impressed with their website, that in the not too distant future I am going to send in some cards to sell as well. Thoroughly recommended on my part. I love the COMC website..I hadnt purchased anything from the site yet, I have been using it only as a seller which has been great. Where else would I be able to sell 90s common & base cards. they are small and starting, but there is huge potential!